Guess Which City Has The Most Damaged Hair In America? 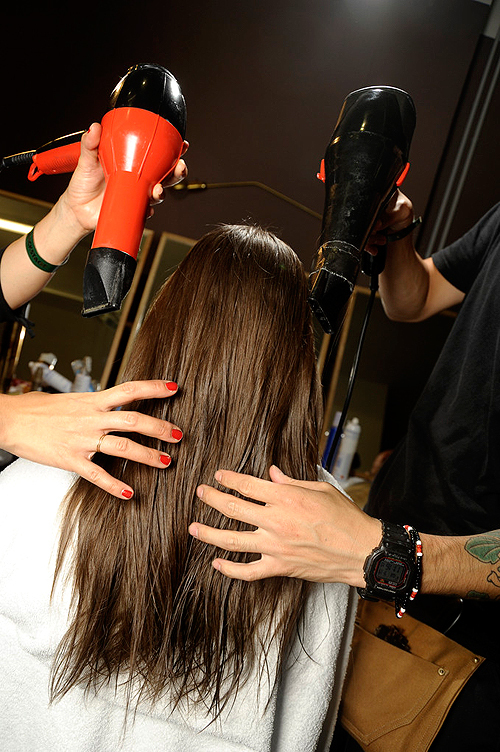 This news might make you think twice before you fire up that flat iron. According to a new survey of U.S. women by Head and Shoulders, 91 percent of us do something to damage our hair every single day. That means we’re using blow dryers and hot tools, wearing tight ponytails that can cause breakage, brushing wet hair or going to bed with hair that’s damp, scratching our scalps and changing our hair color regularly. Yet only about half of us consider our hair to be damaged. Chicago not only had the most women who consider their hair to be damaged (65 percent) but also the highest percentage who color their hair regularly (57 percent). Los Angeles and New York were close runners up, with 60 percent of women who consider their hair to be damaged. In all three cities, over 90 percent of women polled are doing something to harm their hair daily. So what’s the solution, short of a hands-off, au naturel approach that none of us are likely to take (yeah, more like, “I’ll give you my blow dryer when you pry it from my cold, dead hands”)? The best way to counteract damage is by adding moisture to hair, whether it’s with a hydrating shampoo and conditioner (Head & Shoulders has just launched a new Damage Rescue collection; we’re also fans of Pureology‘s Hydrate line), a once-a-week hair mask or styling products that have haircare benefits, such as hair oils, leave-in conditioners and creams. Read more: Does Where You Live Determine How Much Makeup You Wear?